I’m not generally a fan of literary fiction – I stick to genre fiction for the most part – but I did read Michael Chabon’s celebrated novel The Amazing Adventures of Kavalier and Clay some years back, and I found some parts of it arresting, and other parts of it tedious, topped off with a disappointing ending as the book peters out. 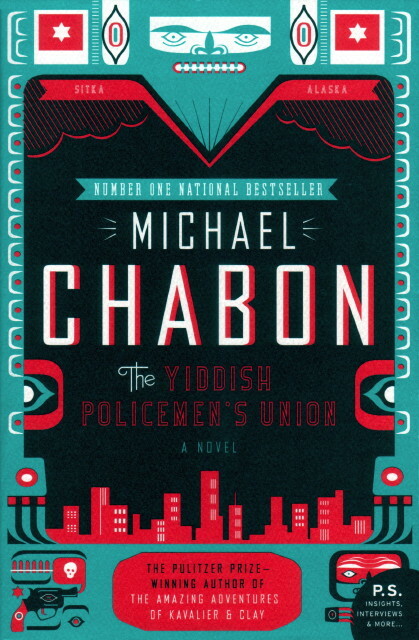 For my book club we tackled his novel The Yiddish Policemen’s Union this month, and by and large I had the same reactions. The story is an alternate-worlds story, in which the United Stated created in 1940 a district for Jews to immigrate to in Sitka, Alaska, Israel then falls in 1948, and Sitka grows to four million Jews. However, the district will revert to US territory after 60 years, and the story opens with less than a year before reversion, and the populace of Sitka are contemplating the diaspora facing them. In this milieu, Meyer Landsman is a police detective, formerly very successful, but now living in a fleabag hotel following a divorce from his wife. In this hotel a young man is found murdered, shot in the head execution-style, and despite being ordered not to investigate, Landsman and his half-Tlingit partner Berko look into it anyway. They find that the victim was the son of the leader of the Verbovers, a powerful criminal organization. Despite being suspended following a gun battle, Landsman continues to investigate the case, uncovering a conspiracy and the secrets of several power figures en route to unraveling the mystery. The centerpiece of the novel is the setting of Sitka, its culture, and the sometimes-whimsical, sometimes-sarcastic sense of humor of many of the characters. Becoming immersed in this culture is the main source of fun in the book, seeing how this marginalized society with a strong criminal element has survived in this remote environment for decades. The aged buildings, the history of the city’s chess club, the island of the Verbovers, and the history of the prominent individuals all contribute to the setting, an impressive and subtle bit of world-building. The characters of Landsman and Berko are well-drawn. Landsman is the down-trodden noir detective, fighting for what he thinks is right even though he’s not entirely sure what that is anymore, or even whether it matters. Berko is the supportive, sidekick, albeit a big bear of a man who waxes philosophical even as he wears his emotions on his sleeve. These two dwarf all the other characters, although there’s a fair amount of variety here, and the main function of most other characters are as ones for Landsman and Berko to interact with. The story meanders all over the place, taking some unusual approaches to the standard hard-boiled detective story: Landsman is suspended, yes, but not really for the reasons you’d expect, and he doesn’t assume the role of the outsider as a result because he’s already assumed that role following the collapse of his marriage. Landsman’s peeling back of the conspiracy and uncovering of the identity of the murderer feel anticlimactic: The ultimate goal of the conspiracy, which is focused on the coming diaspora, seems like a dream unfolding because it’s so grand, so improbable, and also left unfinished, being only the first salvo in a longer plan beyond the scope of the book. The murderer’s identity feels like it’s from out of left field, perhaps not entirely irrational, but more like a tying up of a loose end rather than a satisfying resolution of the event which drove the plot. The other subplot is Landsman’s relationship with his ex-wife, Bina, which I think is perhaps the least successful element of the book, as Bina is a pretty thin character, and the culmination of their story doesn’t really feel believable. I’m conflicted about Chabon’s writing style: I love his ability to define both a setting and characters who fit comfortably within that setting. But his use of language frequently feels too self-consciously arty, and the story meanders around too much, with many flashbacks and digressions, some of which work, some of which don’t. While his command of the overall structure of the story is quite strong, he also sometimes pulls in new elements from seemingly nowhere, such as when Landsman’s late sister becomes a central element of the story more than half-way through, despite having barely been mentioned before then. On balance, I think what keeps the narrative from getting bogged down by all this is the fact that Chabon’s primary style is folksy and humorous, so there’s always the promise of another chuckle a few pages ahead even if the current sequence isn’t so exciting. The Yiddish Policeman’s Union certainly doesn’t live up to the effusive words of praise on the back cover, but it’s still a pretty good book. Chabon’s overall approach is enjoyable enough that I feel like I ought to read more of his stuff. I’m thinking of The Final Solution.